The OPIN® Development Platform provides access to HID Global's access control platform that consists of both hardware and embedded software. The hardware includes VertX EVO™ / VertX® traditional wiring topology controllers, door and IO interface modules, as well as EDGE EVO® / EDGE® IP-to-the-door wiring topology single-door controllers. The embedded software drives the access control functionality on controllers, and is interfaced to using the OPIN API. Together, the solution produces the industry’s most extensive open architecture access control solution. This site and associated Developer Tool Kits provide the development environment for the implementation of access control systems utilizing HID's access control platform, and is designed to provide all the information necessary to get started immediately. 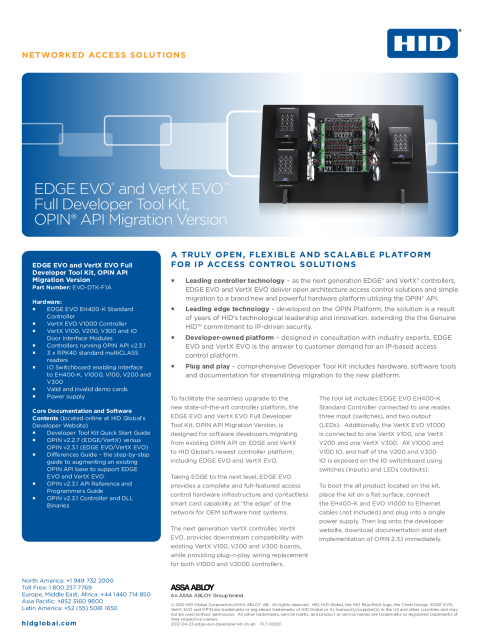 View information on HID's VertX EVO and EDGE EVO Developer Tool Kit, hardware, documentation, firmware, software and tools that enable streamlined development to HID's open architecture controllers.